In August 2012 when I summited California's second tallest peak (Climbing Mt. Langley: Slow Ascent, Lightning Descent) I wound up with a painful strap abrasion on my right shoulder. This was the first time this had ever happened and I put it down to skin that, like the rest of me, is 64 years old and somewhat worse for the wear. But, on the way down from the summit, I met a group of TwentySomethings who had stopped because one of their party had far nastier abrasions on both shoulders than I ... despite a pack that was about half the size of mine. I helped patch him up with extra moleskin and other dressings in the over-sized first aid kit I haul around. Not wanting to go through another raw-shoulder-at-14,000-feet experience, I asked a good buddy of mine, a Chinook pilot with the 160th Special Operations Air Regiment, if he or the boots-on-the-ground SpecOperators he hauled around had any tips. 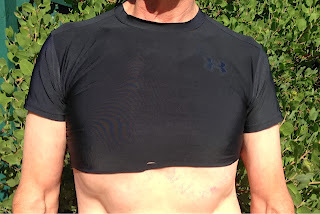 I quickly got the advice to wear an Under Armour compression-fit tee under another shirt -- preferable a sweat-wicking synthetic. Under Armour compression fit tee with sleeves trimmed for summer cooling. Compression because it fits like it was painted on and the next layer can rub without abrading skin. Under Armour because their compression fabric stretches in every direction and does not bind in the arm pits. Don't use a sleeveless tee because the part across the shoulder can bunch and wrinkle. The arm pit part of a sleeved tee anchors things in place. The compression tee does make things warmer, so for summer use, I cut off the bottom to allow more ventilation. I tried this on a recent backpack into the John Muir Wildeness area of the Eastern Sierra and have never, ever been more comfortable. 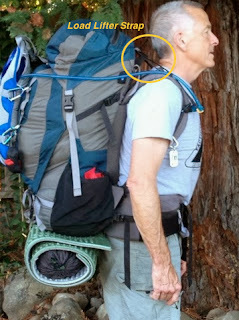 Proper pack strap adjustment will also make for a safer, more comfortable trip. This REI page offers a solid, step-by-step process. Use the hip belt to make sure most of the weight is there and not on your shoulders. Adjust load lifters, shoulder straps and hip belt stability straps to pull the pack in to your body for comfort and balance. When properly adjusted, the pressure from your shoulder straps should be more from the front than the top of your shoulders. You're advised to have a partner walk you through this REI page because they can see things (like the angle of the load lifters) that you can't.